Matsue is a town with some pretty good food. And luckily, you don’t have to leave the tourist area to find some excellent options for lunch. Yakumo-a sits tucked in an old house along the row of former samurai mansions in Matsue’s Bukeyashiki quarter. If visiting foreign-born writer Lafcadio Hearn’s residence and one of the region’s best preserved samurai villas works up your appetite, pop into Yakumo-an for some handmade soba. The restaurant is small – about 7-8 tables – and the menu is even smaller. Your main choices are either hot soba noodles served with slices of kamo (duck) or the wariko soba option. Wariko soba is simply the local Izumo soba – made with the shell of the wheat, giving the soba a darker hue – served in three separate bowls. You can top it with spring onions, strips of nori (seaweed), dried bonito and a dashi dipping sauce. The portion was incredibly large and could probably comfortably feed two people. One of the attractions of this friendly eatery is the beautiful garden that surrounds it. 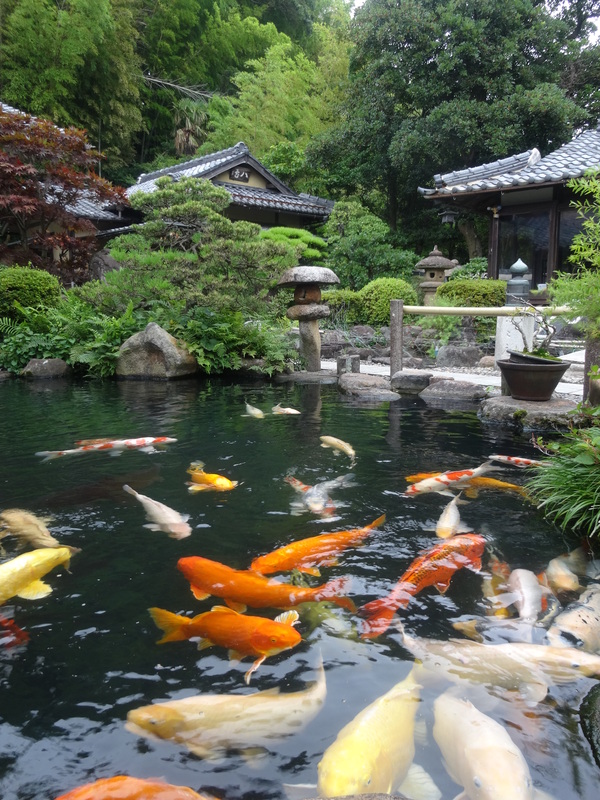 There is a separate building in the back for what appeared to be large group lunch parties (reservations required) and in between both buildings are stone paths, lanterns, bridges and two large koi ponds. One pond houses baby carp and the pond just across from that shows you just what those tiny minnows will grow up to look like if given copious amounts of fish food! The other thing I valued about this establishment was just how welcoming they were to my four-year-old. She’s not a very loud youngster by any stretch of the imagination, but not all restaurants are as openly welcoming to families with young children as others. Yakumo-an went over the top, bringing her multiple “treats” that weren’t on the menu and waving us off after we paid for our meal. Yakumo-an is only open from 10h00-15h00 so plan accordingly if you want to stop in for a meal. It won’t set you back more than about ¥1000 per person.